Gossip Stone: Should Zelda Have a Party System? The Zelda formula has seen its fair share of deviations. Adventure of Link gave us a leveling system. Spirit Tracks let us control Zelda. 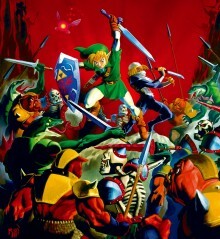 Several titles, like Link’s Awakening, have completely fore-gone the use of the Triforce in the main story. But one aspect that hasn’t been visited is the idea of a party system. Imagine that while you were trying to solve a block puzzle enemies could be destroyed by a designated party member. What if Navi could actually help you fight instead of giving you text lessons? What would this change bring to the Zelda franchise? Let’s take a look at some scenarios and give your input after the jump! I personally am a big fan of JRPG’s, my favorite of which is Final Fantasy X (FFX). It was the first video game that I ever finished and gave me a love for video games that I still have today. One of my favorite elements that JRPG’s have is their use of multiple stories for their varied characters. Now, the Legend of Zelda series has no shortage of diverse characters, but we are unable to experience their stories through their eyes. Their lives are scripted, and our input is, for the most part, unable to effect the end result. In partied games, you get to control these characters and for at least some time feel like you are that character. I personally relate to a couple of characters from FFX, and therefore those characters always end up as my team no matter how many times I play. Now imagine that while you are saving Hyrule, you could control Sheik and discover a dungeon as her. You could personally save Princess Ruto from the ice in Zora’s Domain. You experience her hardships as she learns how to fight and waits for the Hero to return. On the flip side, this other character experience almost negates the purpose of the silent hero. Every time you boot up a Zelda game you can be guaranteed of one thing: Link’s actions are your own. His reactions for certain situations are for the player to determine. His feelings towards problems, say someone getting hostile towards you and attacking, are your feelings. I know when I play Twilight Princess I always have a warm reaction towards Ilia, yet a lot of players don’t have that same attitude. They develop their own ‘Link’ and what his relationship is to the Ordonia girl. And this element is one of the reasons we keep coming to the Zelda series. My Zelda experience is special to me, and the same is true for all players. Do we want this experience? Does Zelda need characters whose attitudes are scripted and we simply control them. I vote yes and no. Yes, I would love to be able to play as certain NPC’s from past Zelda games, but I don’t want their stories playable within the game. I like the idea of their participation to almost be like campaigns, something that is optional to complete either once the game is over or during the game, whenever you feel like it. Or even taking a page from other Nintendo titles, making a sub-game that is devoted to these other characters. I know they have done this with Tingle, (not in the US,) and who wouldn’t line up for a 3DS game about Sheik? But as for having a party within the Zelda games that are required for completion, I vote nay. I enjoy being the lone hero bracing the elements and fighting the unknown evil in the name of destiny. A third scenario we need to look at is how the battle system would play out. Currently all Zelda games are optimized for only controlling a single character. By using items acquired throughout the game you can take on higher challenges that in the beginning were impassible. Adding a party would drastically change how progression is defined. Enemy placement would need to change according to who could take them out instead of what. And unless you could change between the characters in the party, some enemies would be dealt with completely out of your control. I know one reason I love fighting Darknuts is all the moves I can personally do to him as we dance. And taking this away from Zelda seems, sad. What do you guys think? Do you believe there is a strategic advantage to having a party that would improve on the current Zelda formula? Or do you believe Link should stay his silent, single self. Join in on the discussion in the comments below!